# Interested in geology and minerals? Would like to know where gold, silver and gemstone mines are? 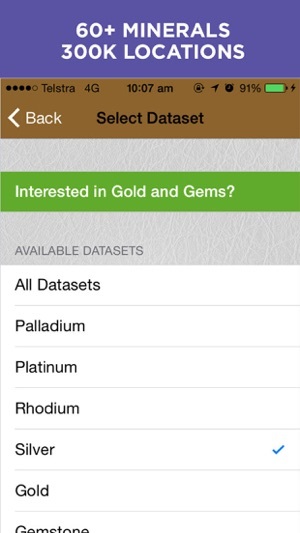 # Our unique app offers a massive global database with more than 300,000 locations and 60+ minerals! # Download Digger's Map, get your hammer and boots and start prospecting today!!! 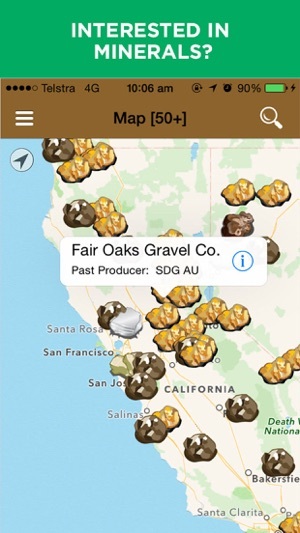 Digger's Map is a unique app which allows users to find natural resources locations and view them on a map. 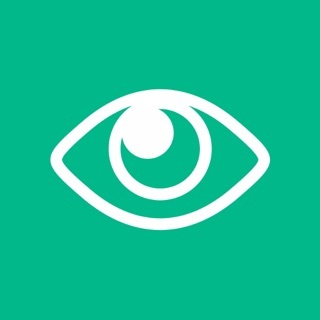 It provides access to additional information and includes a powerful location search. How will you benefit from the app? # If you're a gem/mineral enthusiast this is the app for you. The app offers information on countless operating plants, historic mining sites and other locations. 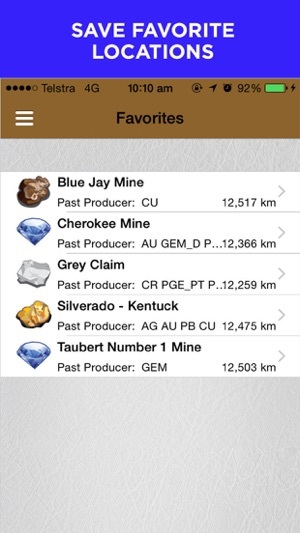 Our app is used by thousands of prospectors and rockhounds. Do not stay behind! 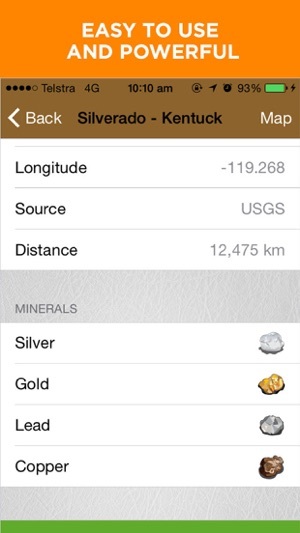 Get Digger's Map app and use the latest technology to learn about minerals and natural resources! # The app includes a global database with more than 300,000 locations. 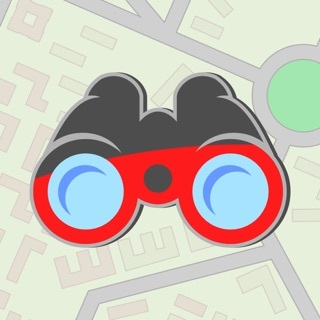 The database is stored on your device, even if you do not have a reception, you can still search for locations. # iPad, iPhone 5 and iPhone 6 support. We made sure our app works on all iOS devices. If you are experiencing problems with the app, please let us know - we are always happy to help. # Easy to use and powerful. The app not only displays the locations on the map, but also allows searching them by a name or filtering them by a development status. If you are looking for a particular location you can easily find it in the database. # Add locations to your Favorites, to come back to them later. # Translated to Chinese, French, German, Portuguese, Russian and Spanish. # We listen to our users and keep adding more features. If you have good suggestions please let us know. Prospecting becomes too easy with Digger's Map! Download the app and try your luck today!!! # Minor bug fixes and improvements. Very informative and well thought out. Intuitive, easy too learn, user interface. Database is fairly current. Parcel lot lines, acreage and current ownership status and contact info are easy too find. Quick access too USGS current and historic site status, past qualitative/quantitative production, information and maps. Clean topographic, bedrock geology and aerial/satellite imagery with layer display options. One downside is that the aerial/satellite color imagery taken in summertime “leaf-out;” the nearly continuous green canopy, that covers 80%+ of the eastern U.S. obscures and hides a lot of very useful and often important information regarding critical ground features. I would suggest an option too select black & white orthophotos or color orthos taken during late Fall after the leaves drop through the Winter months and into early Spring before “leaf-our.” If this feature was available, I’d of given a 5 star rating for this application! I bought the pack to open all datasets. 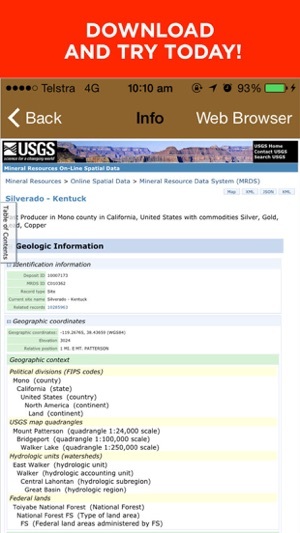 I really enjoy going on the USGS page and getting as much info as I can about that particular mine or prospect. Some mine locations are really close to the portal or adit, or are way off (several hundred yards to a quarter mile) Still, it’s a really enjoyable app to have and explore areas on the map you may want to check out in the future. If the icons or locations disappear and seem to not be working, click on the compass in the top right corner, then they reappear. Seems to work every time I do that. Enjoy!!! I have found that this application has lots of information that I typically use when I go out exploring. I have yet to find if it is real accurate but I will know in a couple weeks.